XLERATOR Hand Dryers Recess Kit 40502 Brushed, Stainless Steel. The 40502 Recess kit makes your XLERATOR an ADA compliant hand dryer. Construction: Wall box is fabricated of 22 GA 18-8 type 304 stainless steel with #4 satin finish with 16 GA. 18-8 type 304 stainless steel dryer mounting plate. All welded construction. (Consult local ADA codes) When installed, bottom of hand dryer will be 10” (254 mm) above bottom of rough wall opening. Therefore, bottom of rough wall opening should be 10” (254 mm) below suggested mounting height for hand dryer. 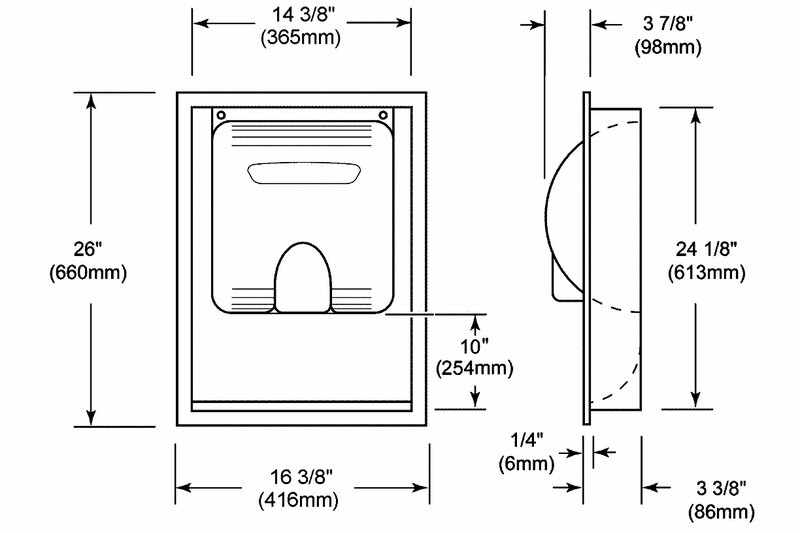 (See suggested mounting heights above for the Xlerator hand dryer recessed kit.). Xlerator Hand dryer sold separately! The Recess Kit for the Xlerator hand dryer by Excel Dryer is MADE IN THE USA! HandDryerSupply.com is the best source for the Excel Dryer 40502 Recess Kit to make your Xlerator hand dryer ADA compliant and recessed in the wall. Limited Warranty The hand dryer shall be guaranteed to be free from defects for a period of five (5) years. Warranty shall include factory performed labor as well as the repair or exchange of defective parts, at manufacturer's option.